UPDATE: Red Brick Station now says that the firefighter has been returned, safe and sound. An iconic figure is missing from the White Marsh area. The firefighter at Red Brick Station restaurant on The Avenue at White Marsh has disappeared. The restaurant says its doorman went missing between midnight and 1 a.m. on Wednesday, January 25th. The firefighter has been Red Brick Station’s official “greeter” since they first opened their doors in 1997. 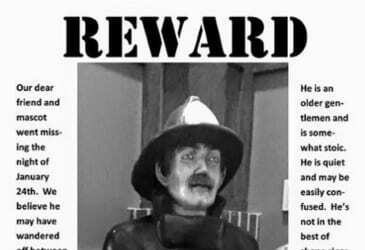 This is not the first time the friendly firefighter has gone missing. The restaurant says the iconic figure has been “injured” in two other disappearances during his tenure. 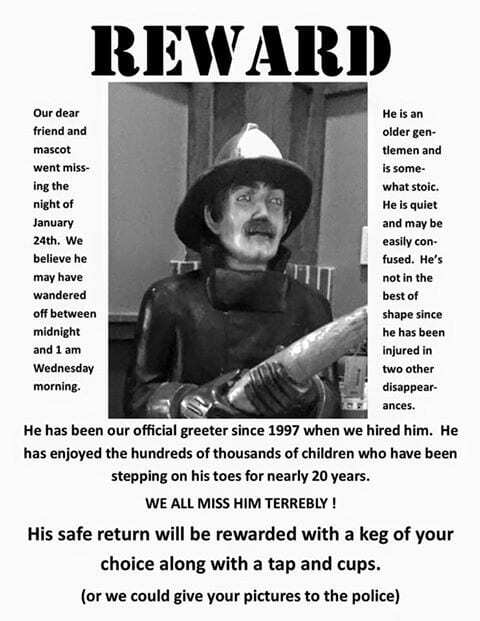 Anyone with information on the doorman’s whereabouts will be rewarded with a keg of beer along with a tap and cups.